Sometimes it's fun to pretend you're a kid again. You know, being carefree, full of wonder, amused by the simple things in life. Take stickers for example - they're simple, colourful and very sticky. The perfect gift to bring out the kid in me. But when you place hundreds of stickers together, on a wall, something magical happens. 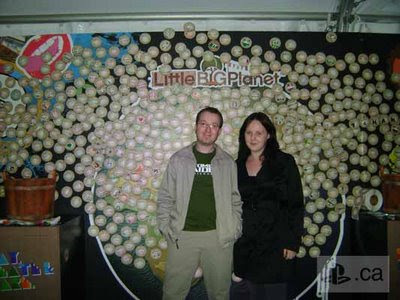 People are drawn to the creation, as I was this past Sunday when I visited the LittleBigPlanet tent at the Best Buy 'Gaming Invasion '08' event. And it seems like I wasn't the only one inspired. There were hundreds like me who couldn't resist the chance to design our own stickers and then pose for a personalized 'Sticker Wall' photo. Although you can't see it, in the top right-hand corner (just outside the white circle) is a cute SackBoy sticker that reads: "Paul Hunter - NextGen Player". Yeah, I was that creative. For those wondering, the person beside me is my lovely significant other Rachel.